Earn 195 - 400 points upon purchasing this product. Use 1950 - 4000 points to purchase this product! Leaky gut is a condition by which the lining of the intestine becomes damaged, leading to increased intestinal permeability. The intestinal lining is one of the immune system’s major lines of defence against infections, toxins, and other threats that are introduced into the body through food and drink. Heal-Ur-Gut™ also supports overall immunity and health. It is strongly suggested that in sensitive individuals that grains and lectins are avoided as a long-term measure. Why does the Gut Leak? A leaky gut happens when the walls of our intestines get perforated or too thin, which allows large food molecules, metals, and microorganisms to pass through them and into the bloodstream. We have learned that no one can properly digest gluten, or more specifically, “gliadin”, a protein found in wheat” ~ Dr Alessio Fasano, University of Maryland’s Celiac Research Center. Normally, the intestinal lining keeps all our yucky waste where it belongs. When the toxins, pathogens, and antigens that our intestines are supposed to protect us from get into the bloodstream, they provoke an inflammatory response that can cause a bunch of health problems. • Medications, such as NSAIDS , antibiotics, steroids, contraceptives, and chemotherapy drugs. • Imbalance of the gut flora. 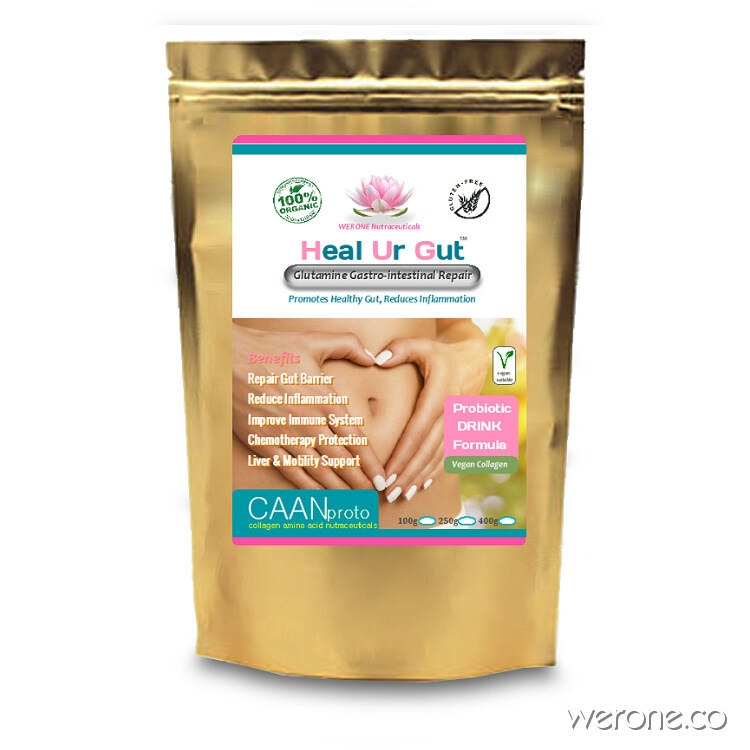 Heal Ur Gut™ (HUG) powdered drink is a collagen-based formula aimed to support the nutritional healing of the lining of the intestine and to help tighten the junctions between the cells preventing larger proteins getting into the bloodstream, Heal Ur Gut™ may also support aspects of the liver. When the lining of the intestine is damaged, the tight junctions between the cells are widened and begin to allow substances into the bloodstream that usually would not be permitted to pass through the barrier. These substances include undigested food particles, toxins, microbes, waste, and larger-than-normal macronutrients (carbohydrates, proteins, and fats). When these substances pass directly into the bloodstream, it provokes an immune response that can lead to food sensitivities, systemic inflammation, autoimmunity, and a variety of diseases. Conventional medicine recognises that increased intestinal permeability (leaky gut) exists, but it does not recognise the role that it plays in overall health and the development of disease, however this may be changing. Suggested Usage: For leaky gut repair, start with half heaped-scoop (3g) in a glass of filtered water twice a day on empty stomach first thing in the morning and before sleep. Build up to 1 scoop twice a day over a week if well tolerated. Follow the LOW FODMAP Diet for 2 – 6 weeks for best opportunity to allow the gut to heal while supporting it’s integrity and repairing it with Heal Ur Gut probiotic drink & capsules. For long-term Gut health avoid: Grains, lectins(beans), peanuts/cashews, chia & nightshades. To Mix: Add the minimum amount of water to the powder to create a slurry consistency, mix with spoon then add extra water. If recovering from Chemotherapy, Radiotherapy or Antibiotic damage, consider adding HQT Capsules & Omega 369 but check with your health practitioner. Best combined with HUG Glutamine Drink, Omega 369 and MEGA Greens and if recovering from Chemotherapy, Radiotherapy, Crohns, Colitis, IBS, IBD, or Antibiotic damage, you could consider adding in HQT Capsules .